This large cairn on Middle Mountain in the Weminuche Wilderness is a “stone johnnie,” or “stone boy,” built by sheepherders. 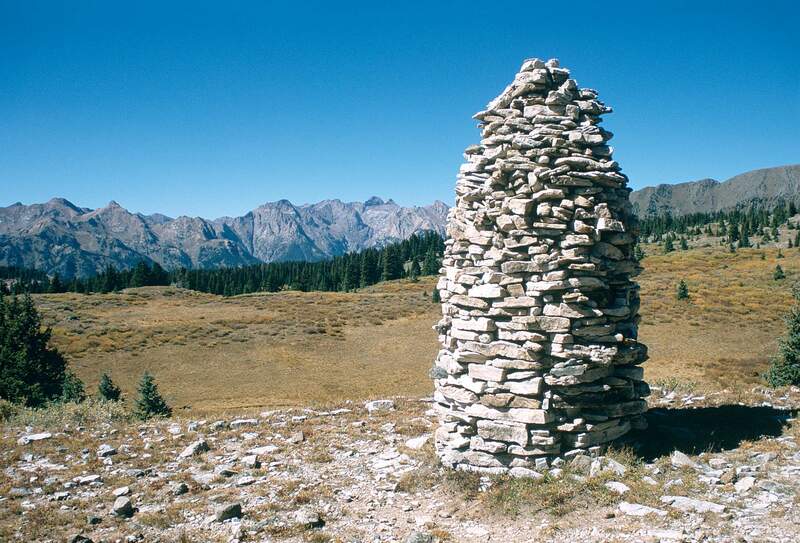 The cairn may have been built to indicate distance and direction to water holes, but cairns also were created as a pastime while tending flocks. The Basque term is “harri mutilak” for these sheepherder monuments found on buttes, ridges, hogbacks and mesas across the West. 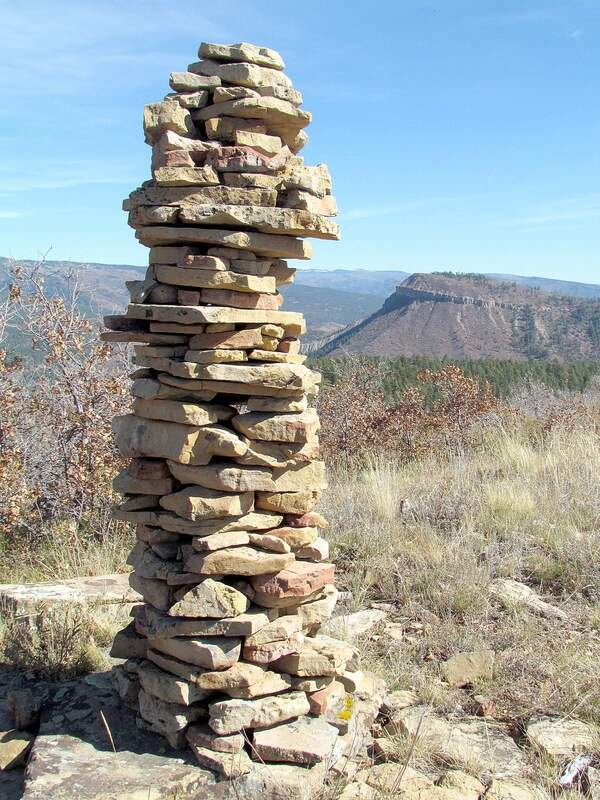 From this large stone cairn atop Perins Peak hikers have a sweeping view east to all of Durango. An almost identical cairn can be found several miles straight west. Cairns are not low stacked stone trail markers. They are often built off trail and can be seen at quite a distance. This cairn south of the La Plata Mountains probably was built by sheepherders. It aligns perfectly with a cairn straight east on Perins Peak in the Perins Peak State Wildlife Area. The word cairn comes from a 16th-century Scottish term and means found stacked stones which have not been shaped, dressed or cut. This cairn in the Flat Tops north of New Castle is one of a half dozen built near Bison Lake as an archaeological feature along the 57-mile long Ute Trail, one of the oldest, highest and longest Native American trails in the U.S.
Stones in a cairn just south of the La Platas display lichen, but because the lichen is not growing between the stones, this is not an ancient cairn. 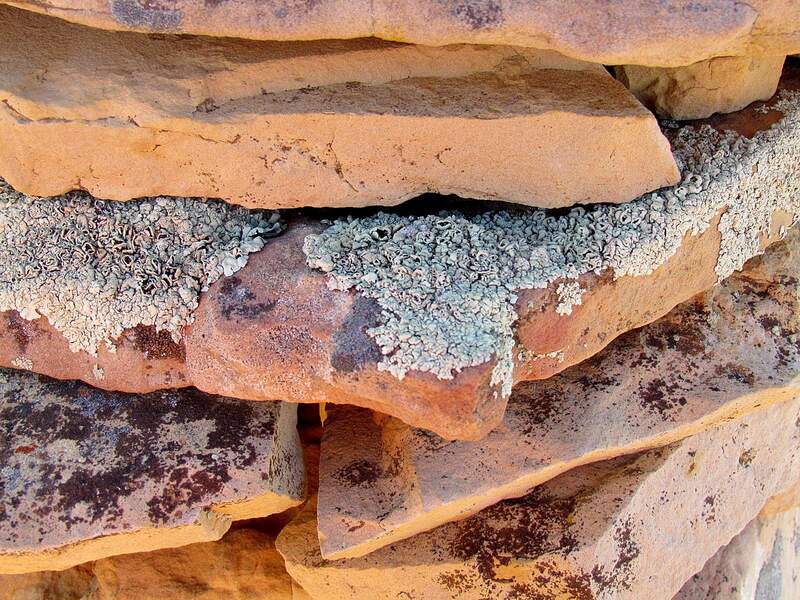 Cairn construction can sometimes be dated by the vivid orange variety of lichen named Xanthoria elegans, which can cement together stones, though lichenologists have done more studies on the genus Rhizocarpon because of its widespread growth and longevity. Taller than a man, this stone cairn, west of Lightner Creek at the base of the La Plata Mountains, stands like a silent sentinel at sunset. 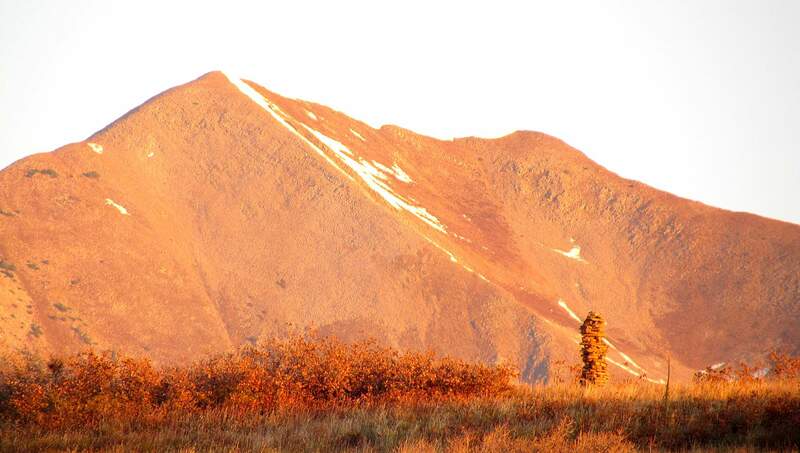 Cairns in the flat expanses of the Arctic help guide travelers and hunters and reassure them that they are not alone. Cairns in the Flat Top Mountains adjacent to the Flat Tops Wilderness may be sheepherder cairns, but Utes also claim the cairns, which stand above high altitude bison wallows made by an extinct species of mountain bison. 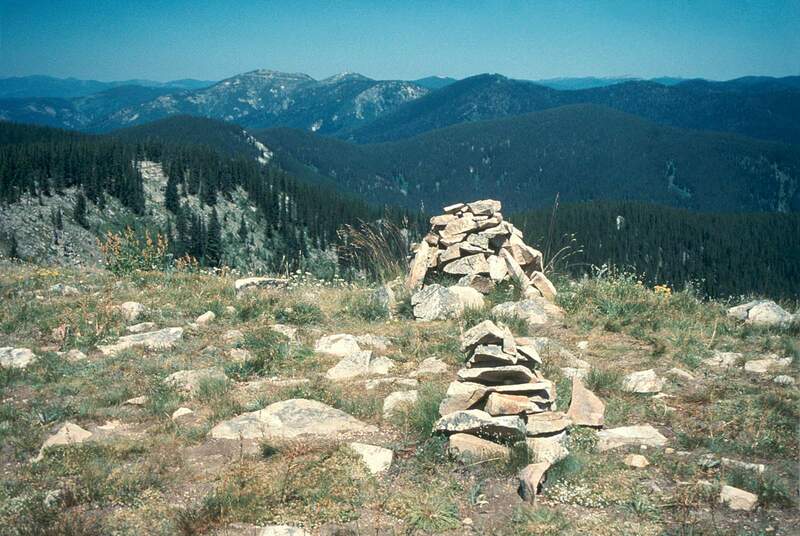 The short stacked cairns at the Nez Perce Smoking Place in the Bitterroot Mountains mark a Native American sacred site. On June 27, 1806, Nez Perce guides insisted that the Lewis and Clark expedition stop on its homeward journey so the guides could offer a pipe ceremony to the Creator. 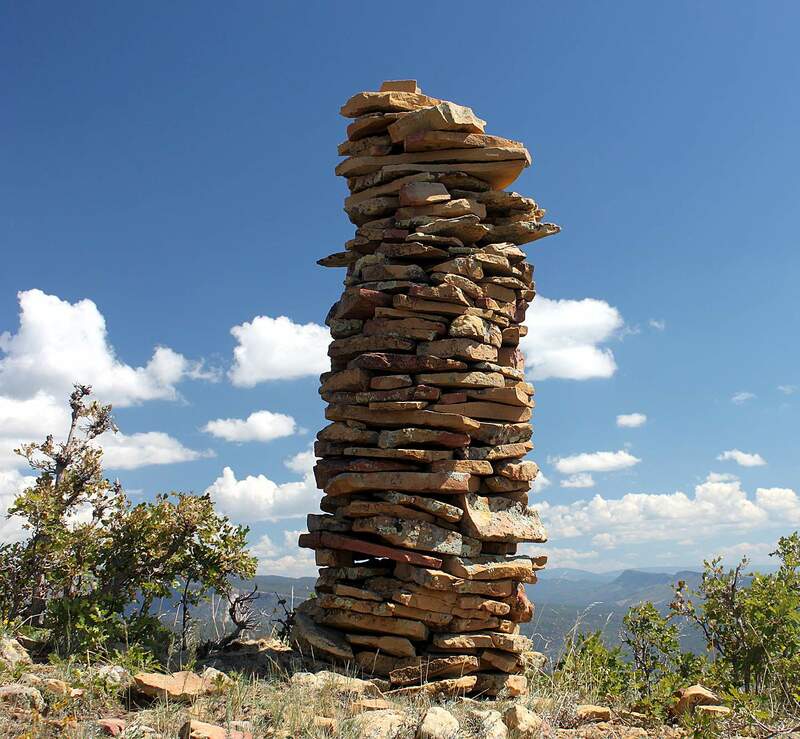 A cairn atop Madden Peak in the La Plata Mountains has been built over time by climbers eager to add a stone. Set in cracked concrete nearby, a U.S. Geological Survey marker from 1934 pegs the peak at 11,972 feet. 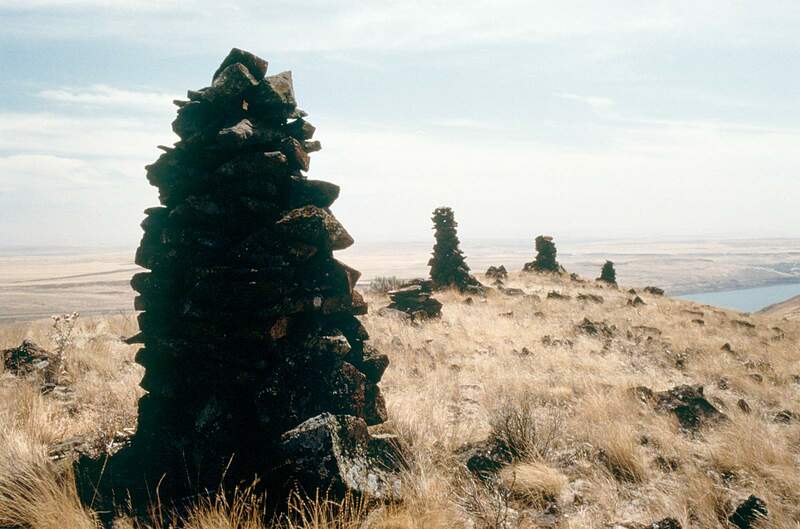 Native American cairns on historic Yakama land on the high plateau south of the Columbia River in Washington represent tribal families and clans and also delineate ancient boundary markers for fishing rights. When the Canadian government created the First Nations province of Nunavut above the Arctic Circle, the first postage stamps the new province issued were photos of inuksuit, or stone cairns. Traveling across the great expanse of the snow covered Arctic, the horizon remains flat and unbroken, the light flat with no sun for direction. “As the distance closes, you are compelled to stop, transfixed by an ancient message left upon the landscape,” writes Norman Hallendy in Inuksuit: Silent Messengers of the Arctic. “Stone upon lichen-encrusted stone, it is an inuksuk, the signature of an Arctic hunter who passed this way on a journey that would last a lifetime ... You marvel at the perfect balance of stones selected and arranged with great care. The size of a young boy, the inuksuk, its mere presence attaching you to its unknown builder, warms you with its sense of humanity. I have long been interested in cairns as more than random piles of stone. Here in the West, on high elevations and off remote trails, we also have an abundance of stone messengers. In Colorado, we have all manner of cairns. We have stones piled for high altitude game drives 9,000 years ago in what is now Rocky Mountain National Park, and there are stacked stones on mountain summits left by the F.V. Hayden surveyors in 1874. Modern climbers on those summits often add a stone or two in gratitude for a successful climb. The act of piling stones in remote places is ancient human behavior. The word cairn comes from 16th-century Scotland and occurs in all Celtic languages including Old Irish and Welsh. Trail markers can be as simple as one stone atop another or the more common aggregation of two flat rocks and one round stone, especially at a point where a trail splits or diverges. But what intrigues me are the larger, more complex cairns – big piles of stone far removed from trail systems. I seek out cairns that took hours to construct with hundreds of pounds of rock that had to be moved to the site and then carefully assembled for balance, form and structure. Across the West when I see cairns on a ridgeline, I’ll stop the truck, whistle to my dog, grab a camera and take an impromptu hike. Why is that cairn where it is? What does it mean? Who built it and when? Two decades ago I left the Yakama Nation Reservation in Washington driving south across the Columbia River Plateau headed for the Confederated Tribes of the Warm Springs in Oregon. I asked a Yakama elder if there was anything culturally to photograph on my journey, and he said to look for a row of cairns high on the plateau before the road began to drop to the Columbia River. I found that ancient line of stone piles, some finished with a hand-sized rounded basalt rock on top and others incomplete. He said they were clan boundary markers delineating fishing territories and created by generations of families who had passed that way. On top of the ridge, with grass waving in a steady breeze, I photographed the cairns and knew they had been there beyond remembering – and would always be there. In the Bitterroot Mountains of Idaho as Lewis and Clark hurried home in the spring of 1806, their Nez Perce guides insisted the Corps of Discovery stop at stone markers indicating the Smoking Place, where tradition required offering a pipe of tobacco to the Creator and to all the directions. I’ve been there, too. Though those cairns have come down and been rebuilt several times, the stones remain. What is it about stones, special places and human memory? At Bosque Redondo and Fort Sumner in eastern New Mexico, where Navajos were forcibly interned from 1864 to 1868, tribal members now bring stones from the reservation as a remembrance and as an offering to their ancestors who suffered. At Skeleton Canyon in southern Arizona, a rock pile from fallen cairns marks the spot where Geronimo surrendered after 25 years of Apache wars. If Native Americans have left stone markers across the Western landscape, so have Basque and Hispanic sheepherders in the Stinking Desert along U.S. Highway 50 in northwest Delta County on their way to Grand Junction. 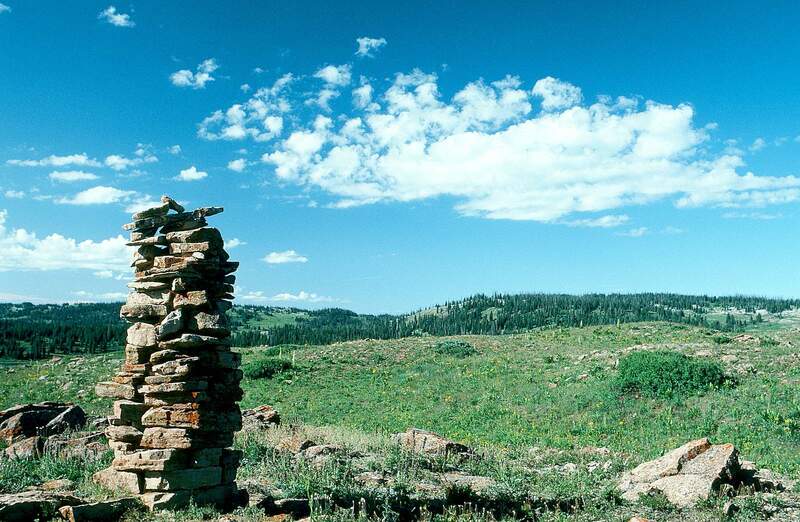 More than 50 cairns built by herders who grazed their flocks in the area since the early 1900s have been recorded. 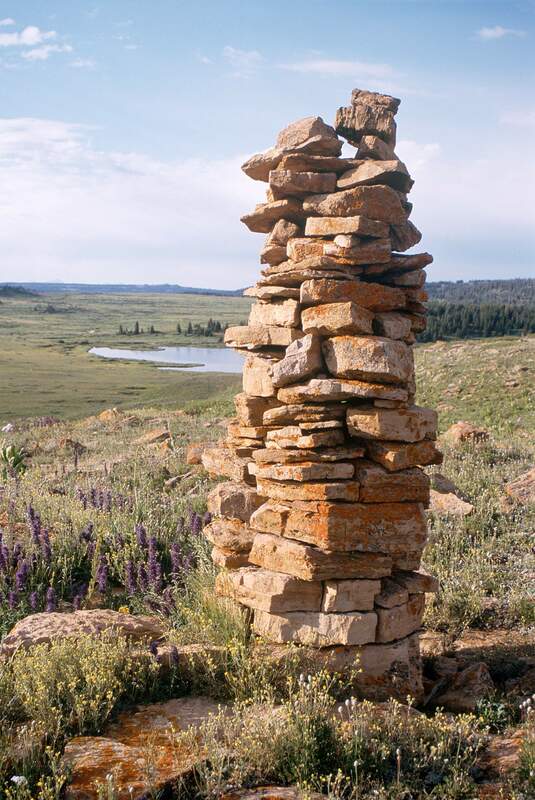 I’ve photographed cairns high in the Flat Tops Wilderness of northwestern Colorado near Deep Lake and Bison Lake. These are ancient cairns with lichen growing between the stones. They are Ute landscape markers positioned within sight of bison wallows made by a smaller mountain bison, which are now extinct but were once pursued by Ute hunters with bows and arrows centuries before the Spanish brought horses to the West. Cairns are scattered across the Weminuche Wilderness above Dollar Lake, on the peninsula between Pine River and Vallecito Creek, on the Cave Basin Trail and on Middle Mountain. Most of these probably came from the hands of sheepherders. Two huge “stone boys,” also nicknamed “stone johnnies,” are on a straight line northwest of Perins Peak stacked with perhaps 1,500 pounds of rock. One on Colorado Parks and Wildlife land is at least 8½ feet tall and 3 feet around at 37 degrees 17.977 minutes north latitude. 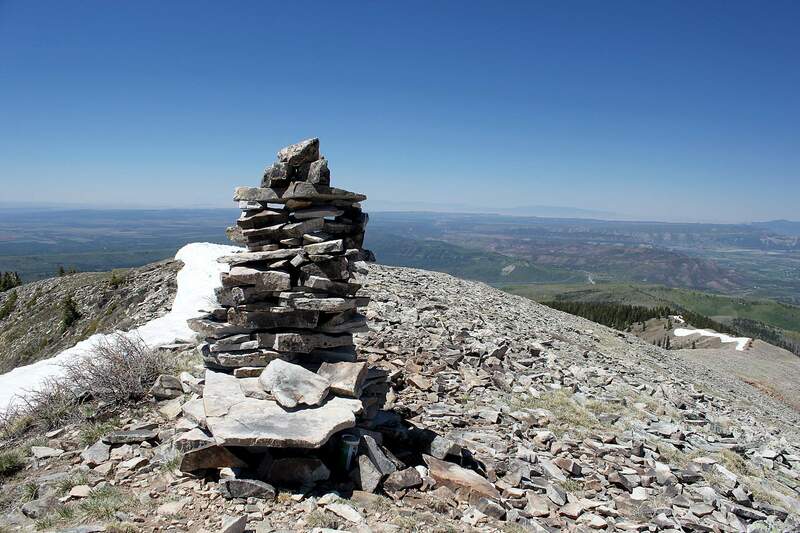 The matching cairn, at the same latitude due west, is on a public land bench below Lewis Peak just south of the La Platas on a south-facing ridgeline west of Lightner Creek. As a hunter, I’ve hiked to both cairns and realized the only way to get those final stones on top would have required being on horseback. What a lot of work! Are these really sheepherder cairns? Are they boundary markers for livestock allotments or for some early government survey? Whatever they are, they’re worth the hike. I’ll keep looking for cairns. I believe in a “leave no trace” hiking ethic, so I won’t be making any large piles of stones, but I’m fascinated when I find them. OK, maybe as darkness descends after hours of trekking, I’ll place a stone or two atop another. Just a few. It’s such a human thing to do.